There’s A Man Down, In A Place! This past weekend, Calista and I went out to capture a few new images for In A Place. Little did we know just what sort of experience the weekend had in store for us. Over the past two months, I’ve been testing the new camera, taking updated and new In A Place photos. Part of this process was about comparing some of my older lenses and lens attachments with the new camera. My excitement was centered on the large increase in megapixels the model has compared to my older camera. Outside my never ending curiosity in exploring the IAP concept, there’s a new development for the project that calls for new images, a development that will be detailed in a future post. The first location we visited was Big Bear, California. The days were sunny and the snow was clean. I had shot in the snow a couple times before, Mammoth Lakes and Mt. San Jacinto, but wasn’t very excited with how the images turned out. I think only one of those images ended up in the art book. With the new camera, I was determined to land some better shots. During this shoot, I noticed a change in how I was addressing the picnic table scenes. I tried to focus on taking images right at the miniature level. As proud as I am on how the older collection of IAP images have turned out, quite a few photos look like aerial photography. This time around, I was eager to get right down on the ground (in this case, the snow) and create/capture the illusion of a full scale picnic table. Once we arrived back home, I didn’t hesitate to transfer the images to the computer. I was extremely pleased with the results, not to mention relieved with the quality of the higher resolution. Next stop on my list, San Francisco. Calista and I spent a week in the city, visiting many of the original locations of IAP as well as discovering a couple new scenes. This trip also allowed Calista and I to tour some print houses and get a better handle on how to print and display a select group of IAP images for gallery and home spaces. As usual, the San Francisco trip was a huge success in capturing some great IAP images. We have tentative plans to return to the city in September to take more pictures. Back in the desert, I started seeking out specific places that I wanted to return to, re-shoot some older shots with the new camera. As it has been during the entire project, some of those locations no longer exist. These situations remind me to pay attention and appreciate the little everyday moments, for “the now” may be ephemeral. So soak up as much of it as you can. IAP locations that are the most susceptible to severe change are places where the images relied heavily on blooming plant life. As mentioned in earlier posts, we live in a resort centric community and landscaping is an ever changing aesthetic. 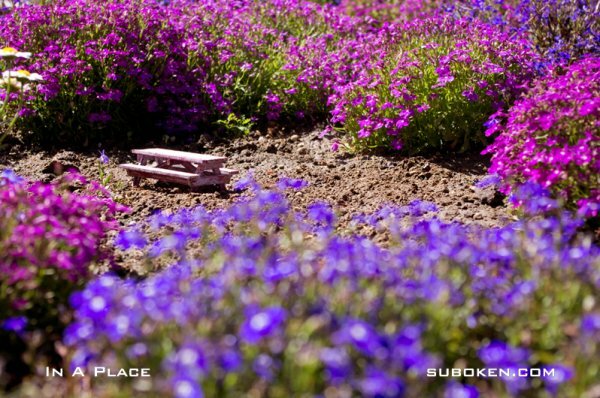 When new plants and flowers are planted along the streets and sidewalks, it is best to take advantage of those scenes for IAP as quickly as possible. This past weekend, some strikingly vibrant flowers were on display along a stretch of Highway 111 in Indian Wells. This length of the highway cuts between two large resorts, and there are no commercial buildings in the area. The highway is also flanked on both sides by long winding sidewalks and lots of trees. In regards to the IAP color palette, natural blues and purples are rare to come across in settings fit for miniature picnic tables. These flowers along the highway were the perfect answer to fill in the lack of those two colors. 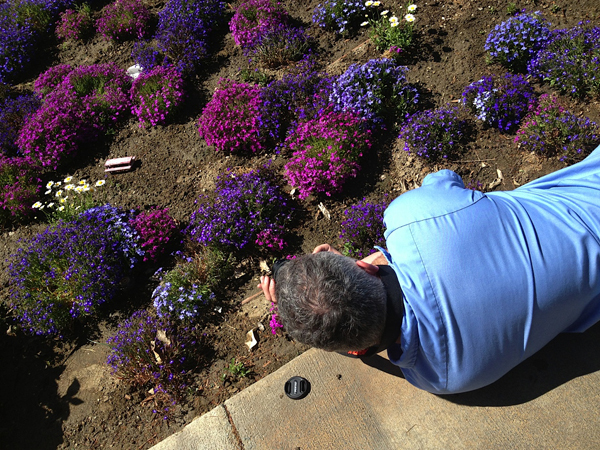 So, Sunday morning, Calista and I set out to get some shots of those flowers, turn them into official IAP scenes. 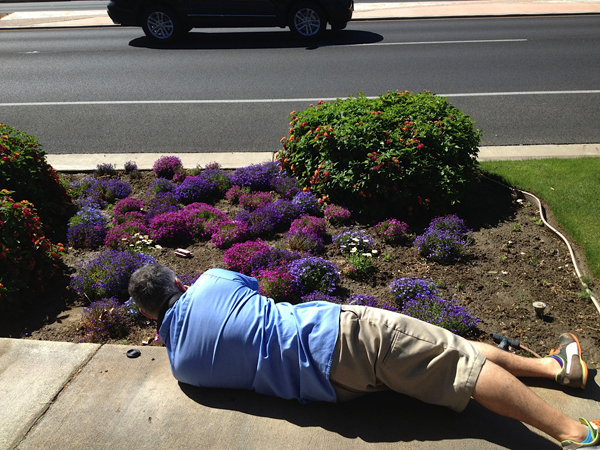 After surveying several flower beds, I found the perfect location for the shoot. Calista and I compared several tables to decide which would fit in best with the landscape. After selecting the old weathered red and white table, I cleared the spot of debris, placed the table, laid down and started snapping shots. Calista stood nearby, looking for alternative IAP locations. The sun was warm. The traffic on the highway was steady but not heavy. And, after about five minutes, a car pulled up and parked next to us. Keep in mind that there are no designated places to park along this section of the highway, although there is a bike lane. We had to park down the street in the city hall parking lot. I didn’t feel like I was on display, but it was odd that the car chose to park right next to us. The only concern that I had in that moment was whether or not the car would be in the shot I was taking. The car then pulled away, but was almost instantly replaced with a new car parking next to us. Realizing how unusual this situation was becoming, Calista walked closer to where I was. The passenger rolled down her window and held out two bottles of water. She was concerned that I had passed out on the ground! She asked if I was okay, and offered to call for help. I quickly explained that I was simply taking pictures of the flowers, and Calista thanked them for stopping to see if we were in trouble. With a smile of relief, the passenger said goodbye, and the car pulled away. Calista and I realized that the first car was probably equally concerned, and chances were that many of the cars driving by might also assume that I was in need of medical assistance, laying there on the ground. The officer pulled up and got out of his car. A friendly yet concerned Officer Colsari of the Indian Wells Police Department walked over to check on us to see what the situation was. I stood up, dusted off my shorts and Calista and I explained what we were working on. Officer Colsari informed us that someone had called in and reported that a man was on the ground and that someone was giving him CPR! He added that the paramedics were already in route. No sooner had he said it, a fire engine and ambulance drove up on the other side of the street. Officer Colsari waved them on, and Calista and I apologized for all the confusion. I formally introduced myself and shared some of the details of the IAP project. Calista even handed him a business card and invited him to check out suboken.com. Satisfied that all was well, Officer Colsari drove off. I returned to getting the picture, although my diligence in quickly getting the shot was certainly heightened. Our faith in humanity restored, confident that I had taken some great images for IAP, we wrapped up the photo shoot and walked back to the car. Of course, as we approached the car, I had my traditional IAP face palm moment. I should have asked Officer Colsari to pose with me for a blog picture!